Leeds United produced a four star display at Derby County to follow-up their opening day victory against Stoke City with a second win in the Sky Bet Championship. Marcelo Bielsa’s brilliant start as United head coach continued in great style as the team won 4-1 in what was remarkably their first away win since Boxing Day last year. And the impressive victory was achieved with 10 of the same players who could not get Leeds into a top half finish last season. Kemar Roofe led the way with two superbly taken goals while Mateusz Klich scored for a second game in a row and Ezgjan Alioski put the icing on the cake with a fourth goal. 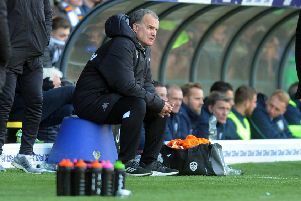 It could have been more such was Leeds’ control of a game against one of the teams expected to challenge for promotion. Klich opened the scoring on the opening day for Bielsa’s side and he repeated the trick, curling home a shot impressively from just outside the area after an equally impressive break. Tom Lawrence hit back for Derby when his swerving free-kick deceived Leeds keeper Bailey Peacock-Farrell and evaded his dive for the ball to end in the net. United did not lose their confidence, however, as Samuel Saiz sent a volley wide from the edge of the box and a second goal followed when Alioski’s excellent cross was equally impressively headed home by Roofe. Leeds stayed on top with Luke Ayling seeing two shots blocked in the box and Saiz having a shot saved by Scott Carson following a nice link-up with Klich. Derby improved straight after the break as Harry Wilson fed Mason Mount, but he dragged his shot just wide of the post and just beyond Martyn Waghorn’s despairing dive to reach the ball. Craig Bryson sent an effort wide from Lawrence’s pull back, but the visitors got back on top with Roofe’s header well saved by Carson after Ayling had nodded back Saiz’s clever chip. The follow-up effort by Ayling was well blocked and Derby survived. Leeds need not have worried about the near miss as they made it 3-1 on the hour, Roofe producing a great turn in the area to get clear before rifling a left foot shot into the top corner of the net. It was 4-1 five minutes later when Pablo Hernandez did well to reach an overhit long free-kick into the area and his pull back was smartly headed home by Alioski. Saiz fluffed a good chance to add to the lead when his attempted chip over the keeper went wrong and Ayling sent a long range shot wide. Mount had a shot saved at the other end, but United remained largely in control to see out an impressive success. It has been a flying start to the season, but head coach Bielsa is not getting carried away. Derby: Carson; Wisdom, Keogh, Tomori, Lowe; Bryson, Ledley (Johnson 45), Mount (Bennett, 74); Wilson (Jozefzoon, 61), Waghorn, Lawrence. Leeds: Peacock-Farrell; Ayling, Berardi, Cooper, Douglas, Phillips, Klich (Shackleton, 73); Hernandez, Saiz (Baker, 86), Alioski, Roofe (Bamford, 79).